Front gardens are under a lot of pressure to make a good impression, and in some areas there are even laws defining what can and can’t be grown curbside. For the keen food gardener, this can pose a problem – how to make the frontage look appealing while at the same time being productive? Many herbs look great and smell irresistible, making them perfect for appeasing stringent housing association rules (or fussy neighbors) without compromising on making productive use of your garden space. When laying out your front garden, think about the permanent elements first: boundaries, paths and perennials. Lavender and rosemary make very attractive wind-filtering hedges, and will continue to provide interest when herbaceous and annual plants have died back in winter. You could also try santolina (also known as cotton lavender) or hyssop. Dwarf varieties of lavender such as ‘Munstead’ make beautiful fragrant path edgings, or use compact curly-leaved parsley. The paths themselves can become a home for herbs too. Crazy paving can be a headache to weed, so why not plant creeping thyme or lawn chamomile in the gaps? As well as suppressing weeds, they can tolerate light foot traffic. The scent that is released when they are stepped on will make any garden guests feel very welcome! Non-flowering lawn camomile can even be used to replace your boring old grass lawn (and it needs much less maintenance), or try a flowering thyme for an attractive carpet that will be buzzing with bees. If your lawn is often used as a short cut to your front door, lay stepping stones to avoid too much wear and tear. The entrance to your garden is a great opportunity to use structures to add height and a bit of drama. A hop vine invited to clamber up an archway at your gate or doorway will provide a seasonal vegetable as well as decorative hops cones that can be dried as a great-smelling pot pourri or used to flavor beer (and what gardener hasn’t been tempted to make their own home brew?). Parterres and knot gardens – blocks of plants within an arrangement of low, clipped hedges – were originally used in the gardens of sprawling country houses, but they can be used to great effect on a smaller scale in a formal front garden. The framework of low hedging can be any shape you like, from simple squares to swirling Celtic designs. Fill each segment between hedges with your favorite flowers and herbs, one type of plant in each section. 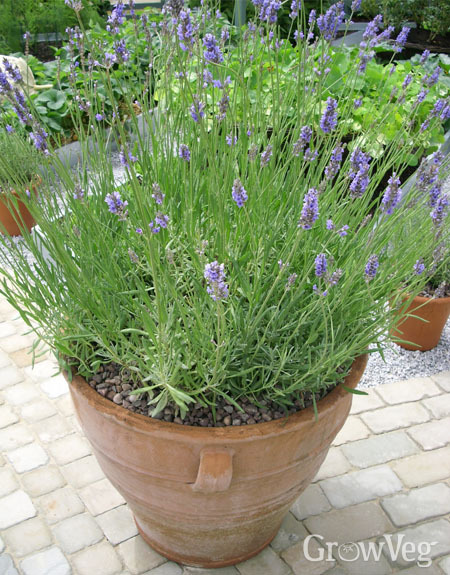 Slow-growing dwarf box is traditionally used to define the pattern of knot gardens and parterres, but santolina, lavender or rosemary may also be used for a less formal look. Herb wheels can be constructed using bricks laid on their sides in a circle, with more rows of bricks making up the ‘spokes’ of the wheel. Each segment is made up of one type of plant, so the more herbs you want to grow, the more spokes you will need to include and the bigger the wheel will need to be. A more complicated but very effective design is the herb spiral, which has the dual advantages of adding a little height to the garden and providing a range of growing conditions for different types of herbs. The spiral itself is usually made up of rocks, bricks or blocks, spiralling gently upwards. At the base of the spiral is a small pond, which provides a home for moisture-loving plants such as watercress. Slightly above, still in a damp area, is where mints and lady’s mantle are grown. The very top of the spiral is the best spot for sun-loving herbs that tolerate drought, including lavender, rosemary, thyme and sage. In between are planted a wide range of herbs with heat-lovers such as basil, coriander and sorrel on the sun-baked side and shady characters like parsley, chives and cress on the other. Even if you have a tiny garden you can still grow herbs out front. Many herbs are well suited to containers. Why not try terra cotta or stoneware pots, urns or troughs filled with sage, parsley, basil and mint, or a windowbox dripping with thyme or marjoram? Grow your favorites closest to the front door so it’s no bother to nip out and quickly snip off what you need for your next meal. Mint is one herb that should always be grown in a pot, as it spreads like ground elder if grown in the open ground. A pair of containers, one either side of a doorway, looks very smart. If money is no object you can purchase pre-trained plants – for instance bay shaped into a lollipop, with a straight or spiral stem, or rosemary that has been clipped into a smart pyramid. Symmetry is the key to the effect, so it’s important to maintain the trained plant with careful clipping – and make sure to avoid harvesting only from the side closest to the door! What are your favorite ways to use herbs in your front garden? Drop us a comment below and share your tips for planning and planting a fabulous, productive herb front garden!